Juventus have reportedly failed in their approach to sign defender Andreas Christensen from Chelsea during the ongoing transfer window. The 22-year-old has struggled for gametime under Maurizio Sarri this term and he has been restricted to just 12 starts - most of which have come in the cup competitions. As such, there has been regular speculation regarding his future but Tuttomercatoweb claims that the Dane is unlikely to leave the Blues at the midway stage of the season. Christensen has experienced a mixed relationship with Sarri since the Italian took over at the helm and he is said to have recently angered the head coach after leaving the bench before the conclusion of the Arsenal game. Juventus are understood to have sought an initial loan agreement for the central defender but their approach has been rebuffed with the Blues still participating across four competitions. 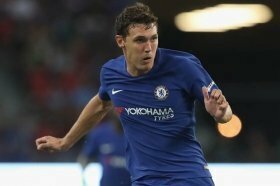 Christensen has not featured for Chelsea since January 5 but he could make an appearance over the weekend where the club are scheduled to host Sheffield Wednesday in the FA Cup fourth round.